I’ve been going to conventions for quite some time now and after a few years at Gen Con, I finally had the urge to enter a tournament at one. The prospect was interesting, but to make it really fun, I felt like I should live Tweet it as well. I reached out to a few game publishers and the folks at Wizkids loved the idea. After a bit of brainstorming we decided I might do my best playing in a Heroclix Battle Royale, where four players hop on a mat and beat the crap out of each other for an hour and some change. 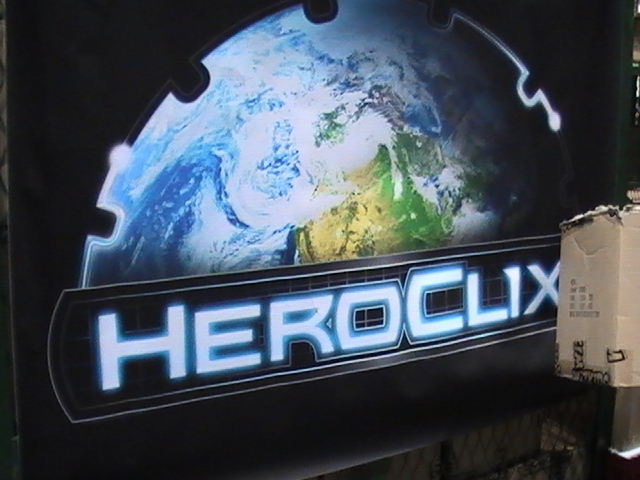 For those who don’t know Heroclix, it’s a miniature game where you build a team based on points and roll dice to determine the dice of actions. Those figures tend to be based on comic properties, though there’s some variations. Think chess where dice are involved and instead of a bishop, I get Bishop from the X-Men. I knew a little about the game, having played a few demos at conventions, and that’s about it. I have a box of figures I’ve picked up over the years, but other than that, I couldn’t tell you any of the intricacies of the game. This was a good thing, because the more I know about a game, the more I tend to manipulate things and get really good really quick. So, the less I knew, the more fun I’d have in general instead of actually focusing on winning. Actually, let’s be honest, I’d be focused on crushing my opponents. I waited in line waiting for my turn to be matched up and luck would have it, they needed a person to play in a Marvel game. There’s two major lines of miniatures based on Marvel and DC Comic characters, and the figures can be played against each other. I’m more of a Marvel person, so I was hoping I’d be able to get in on a game of that, mostly since I know the characters a lot better. I was matched up with three other players, two have been playing over 10 years and one since the game launched. That’s some experienced players who began chatting about strategies and figures and combinations. I told them I’ve played a few games and had little experience, cut I was doing this “for science.” They were cool with it and would walk me through as much as they could. I knew how to move and punch, and that’s what I felt I needed to know. The basics. The theme that was being played was a recently released set based on Spider-Man and horror characters from Marvel. Spidey isn’t my strongest suit, so I wasn’t as familiar as I hoped. This was a draft where we each chose figures and passed them around to draft one at a time. Instead of focusing on combinations or powers, I decided to have some fun and try to draft as many versions of Spider-Man as possible. I was able to pull off three versions in the end, if you count Spider Girl, and two Marvel monsters. Find some weak opposition and punch him or her a lot. The game began and the figures started to move. I zeroed in on my target, Miles Morales (sorry Miles). I figured a bunch of figures should easily beat up a kid. Oh how wrong I was. Surrounding him with everything I have, I punched, a lot, and punched some more, a lot. I was doing some damage, but clearly not enough. The dice were rolling, the conversations were having and I found myself having a really good time. While it was clear my opponents where a bit more focused on winning, I was there to see how the game was played and have a good time. Rounds passed, punches were thrown and Miles still stood. Though I drew first blood out of everyone, it didn’t seem like I was going to finish Miles off. The little dude just wouldn’t go down. After a few rounds, I really have no idea how many, the judge came around to have us wrap the game up. I clearly did not win this little tournament. I think I came in dead last if anything. But I came away seeing exactly why people enjoy this game and tournaments in general. They give you the opportunity to go up against some of the best players out there, and do so under pressure. Heroclix gives you the opportunity to live out battles with some of the most iconic characters out there, and do so in a game where anything can happen. Coming out the game, we all got to choose what figures we wanted to keep. The three players had them all except a couple, which they grabbed, leaving me with almost everything. They wanted to give me a chance to start off right and put a best foot forward when it comes to my new Heroclix addiction. Did I do well? No, I kept up my craptacular Gen Con 2013 streak of losing in every game I played. But, I had a lot of fun and walked away wanting to check out what I missed. I think Gen Con 2014 I’ll be back, this time with a clue and god help whoever I get paired with.